You've invested in the perfect dress, the perfect venue, and the photographer to capture every second of the BEST. DAY. EVER! Hiring me as your makeup artist will give you the luxury of having pure confidence in front of the camera and being surrounded by a friend and not a stranger on your wedding day. Enjoy that mimosa and the company of friends and family with no stress. For inquiries on your date please fill out the form below “the fine print.” Thank you! Lashes included in each application. All applications for bridal party include lashes. Flower girl: blush & lip gloss free of charge! Reach out today to book with the current pricing. Every service will take 45 minutes, with the exception of just eyes at 20 minutes. The makeup schedule will be made by the lead makeup artist and will be structured around this time. 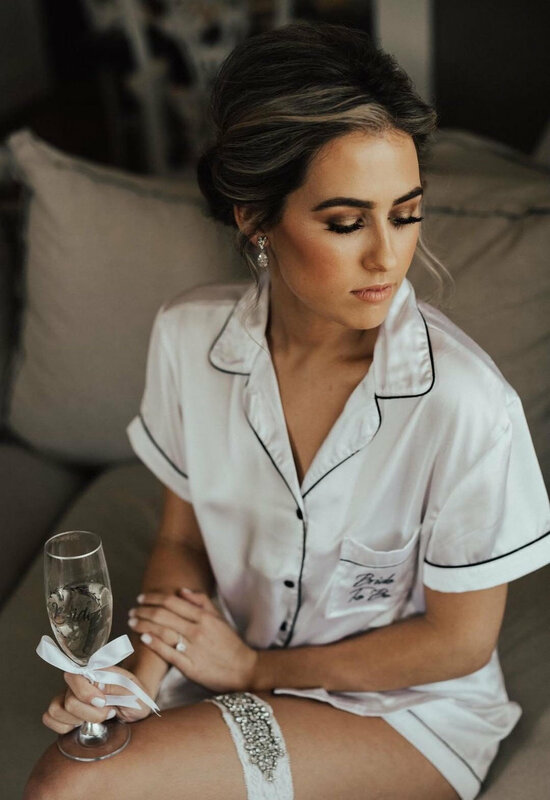 If there is a bridal party with 8+ people and/or limited time frame Megan will bring on an assistant and work in 30 minute appointments, but no less. Assistants will prep skin and prepare base for Megan to concentrate on the detailed work. If Megan needs to hire a second artist to accommodate larger parties and/or limited time schedules there will be an additional fee. Early morning fees will be applied if a job is needed to begin before 8am. There is a $700 minimum for Saturday weddings and a $500 minimum for Friday and Sunday weddings. Travel fees will be applied after 25 miles of 30342. Each travel fee is custom based on arrival time, distance, time spent traveling. A 50% non-refundable deposit and a signed contract is due at the time of booking to officially hold a date. Dates cannot be held without both in hand. The remaining 50% balance will be due 7 days before the wedding date. All payments for all services are to be received by one person. Now, let's get one more thing checked off your list! Fill out the form below and I will get back to you as quickly as possible. For special events, such as maternity photoshoots, headshots, etc. Please fill out the form below in the Special Events section! Thank you! Life is full of special events that you want to have captured. Photography is a beautiful thing. It allows us to hold on to those memories forever. Let me help you shine with confidence in front of the camera! Become your own makeup artist expert by learning some of my favorite tips and tricks. From skincare to mascara and everything in between. The Master Class is tailored to you and your needs, no matter your experience. The class can be in a group setting or one on one. If you're interested in a more laid back version of the Master Class and a "ladies night in" ask me about a Blushing Belle Party! Your best girls, makeup, and wine. Need I say more? Pricing varies on content and time. Fill out the form below and let's get glam! In the message section let me know your experience and what you're interested in learning. For example; smokey eye, fresh everyday look, perfect skin, Blushing Belle Party ect.